Shrinkflation occurs when firms reduce the size or quantity of a good and keep prices the same. Shrinkflation is an alternative to increasing prices, and you could argue it is a disguised form of inflation because if you wanted to buy exactly the same quantity of the good, you would have to spend relatively more. However, shrinkflation won’t show up in the consumer price index because prices stay the same. In 2009 a Mars bar was reduced in size from 62.5 grams to 58 grams, while the price remained at 37p. In 2010, Tetley tea bags was sold in boxes of 88 instead of 100. In January 2009 Häagen-Dazs reduced the size of ice cream cartons in US from 16 US fl oz (470 ml) to 14 US fl oz (410 ml). In 2016, Toblerone reduced the 400 g sized bar to 360 g.
Cadbury cream eggs sold in packs of five rather than six. Rising input costs. If a commodity rises in prices, manufacturers see a rise in costs. One option is to reduce the quantity of the input. 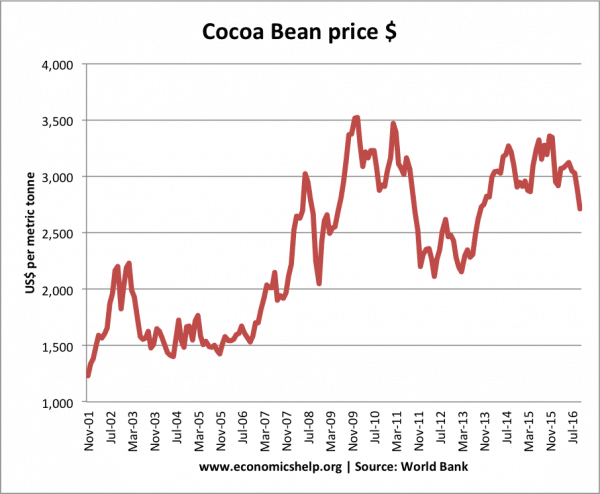 In 2009/11, many manufacturers struggled with a rise in the price of cocoa. This caused many chocolate bars to be reduced in size in order to absorb the higher cost of raw materials. Monopsony buying power of supermarkets. The supermarket industry is competitive in retail, but the big supermarkets have significant influence over their suppliers. In a competitive market, supermarkets often strive hard to keep prices down. Shrinkflation is a solution to a situation where supermarkets don’t want to pass on any price increases on to consumers. In 2009 when Sterling fell by 25%, supermarket prices were increased in the UK, but this helped discount retailers Netto and Aldi gain increased market share in the UK. In 2016, supermarkets are keener to prevent price rises – hence the recent dispute between Tesco and Unilever over Unilever’s demand price for goods like Marmite should increase 10%. Rising commodity prices during a period of deflation. When your commodity is rising much faster than average prices, the price increases stand out more. Rising cocoa prices 2006-12 often contrasted to a general period of low inflation. Shrinkflation less visible than price rises. If a giant Mars bar reduces in size from 62g to 58 grammes – at 6% smaller most people wouldn’t notice. Consumers are in the habit of checking prices rather than the quantity and size of the product. The Toblerone example is interesting because it was much more noticeable to people who buy it. If Toblerone had made the bar 10% shorter but kept the gap the same – people probably wouldn’t have noticed. But, by increasing the gap, it became of viral interest. It gave Toblerone lots of publicity – but perhaps publicity which damaged their brand image. Harder to calculate inflation. inflation measures changes in the average price level. It works on the assumption the basket of goods stays constant. If the goods are getting smaller, the price level becomes a misleading guide. Every year the basket of goods is updated, but it is hard to take into account 5-10% declines in the size of the product. On the other hand, the price of mobile phones may stay the same, but each year their quality increases. Decline in consumer trust. Although many examples of shrinkinflation pass by relatively unnoticed, consumers can notice at a later date and feel they are ripped off – because it might feel more sneaky than raising prices. There is also a limit to how much you can keep reducing the size and quantity of goods.